Springs Preserve is a beautiful location in Las Vegas for weddings. Springs Preserve was the bride's dream wedding location and mine as well for photo sessions and weddings. It’s really different than other Las Vegas locations. It's green, especially beautiful in the spring, when the flowers are blooming all around. It gives a little magic to the place. 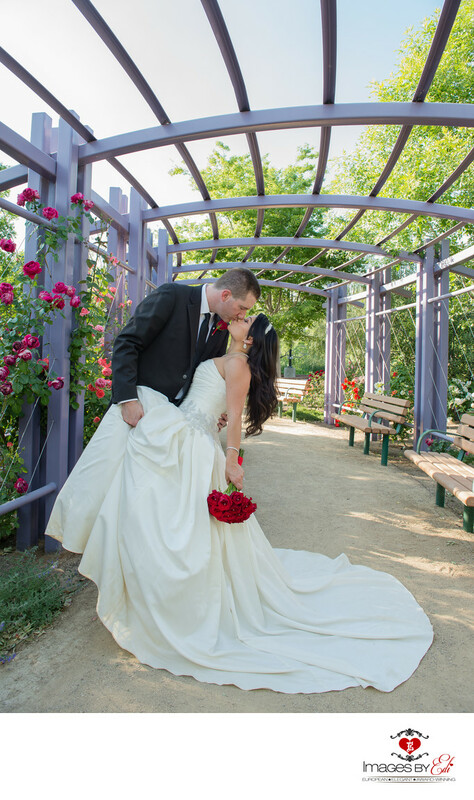 This intimate moment was captured in the Rose Garden, on a beautiful, sunny day, with beautiful red and pink roses blooming behind. After their Springs Preserve wedding and photo session we drove to the Strip to compliment the greenery with a little urban look and create some images by the Las Vegas sign. A couple of months later the couple had a full day traditional Cambodian (Khmer) wedding in California.